Atlassian Jira is used in numerous companies to control product development - with traditional or even agile methods. However, there is often a need to specify products in detail beforehand or to consider customer requirements at the beginning of development, while the implementation follows agile processes. The coordination regarding content with customers (internally as well as externally) and users of a product must be carried out holistically and is mostly decoupled from the iterations of the development. Only in this way planning security and continuity can be ensured over the entire product lifecycle. In addition, traceability is required between requirements and all other development activities - it is an integral part of the required compliance for regulated organizations. Atlassian Jira is sometimes used to manage requirements, but due to the lack of fundamental functionalities, you quickly reach the limits of the system. Baselines, variants/branches, document structures etc. are missing and of course are included in specialized requirements management tools like agosense.fidelia. That's why we've extended agosense.fidelia for perfect interaction with Atlassian products and offer a plugin for Atlassian Jira, which combines classic requirements management with agile development to get HYBRID! Implementation status, test coverage, etc. are traceable at any time. Structuring in relation to product architecture, components, etc. Compared to other requirements management plugins for Atlassian Jira or the use of complex, resource-intensive queries and filters, agosense.fidelia works completely independently of Atlassian Jira and has no influence on the system performance. Documents with tens of thousands of requirements and flexible scalability through modern clustering technology are no problem for agosense.fidelia. agosense.fidelia offers by far more than most other RM tools in the market - and all this at an extremely favorable license pricing. On top of this, agosense.fidelia requires minimal efforts in regards to administration and hardware/software equipment - a fraction compared to other products. agosense.fidelia starts from 50 Euro per month/user and is available in different license models (Subscription, Named User and Floating User). 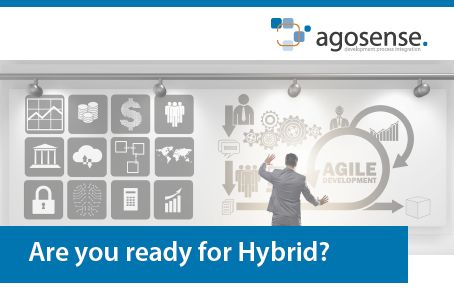 In our new paper we will provide you with a high-level overview how agosense can help you to evolve your Agile into a Hybrid strategy.